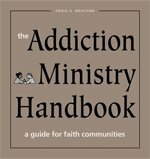 Addiction Ministry Handbook - a guide for faith communities by Rev. Denis Meacham a certified addictions counselor, and affiliate minister at First Parish Brewster in Cape Cod, MA. It is published by Skinner House Books. The guide offers inspiration, guidance and tools for launching and sustaining a congregation-based program to identify and support individual members affected by drug and alcohol addiction.